For a plant that emits an overpowering stench of rotting carcass, you’d think the corpse flower would have a PR problem. But it’s quite the opposite: Anytime a corpse flower opens up at a botanical garden somewhere in the world, visitors flock to catch a whiff and get a glimpse of the giant plant, which can grow up to 10 feet tall when it blooms and generally only does so every two to 10 years. 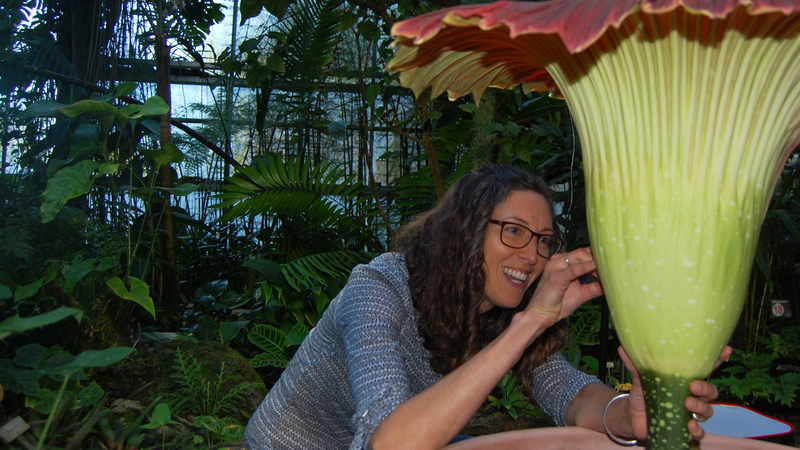 Corpse flowers -- also known as titan arum -- open when it’s warm, and biologists at botanical gardens around the Bay Area are tending to the fickle plants in preparation for potential blooms this spring and summer. The University of California Botanical Garden at Berkeley has 19 corpse flowers; the Conservatory of Flowers in San Francisco has five. And nearby, the UC Davis Botanical Conservatory has close to 20. In October, a corpse flower known as Maladora opened at the UC Botanical Garden, that plant’s first bloom there since 2010. And in June, Terra the Titan opened at the Conservatory of Flowers, attracting 6,000 to 8,000 additional visitors. Could a repeat be in order soon? At the UC Botanical Garden, Vanessa Handley, director of collections and research, said there’s “a decent chance” one will put on a show this summer. And at the UC Davis Botanical Conservatory, collections manager Ernesto Sandoval is keeping his eye on three plants that he thinks could bloom as early as this spring. A corpse flower’s whole survival strategy is based on deception. It’s not a flower and it’s not a rotting dead animal, but it mimics both. Pollination remains out of sight, deep within the plant. KQED’s Deep Look staff was able to film inside Maladora when it bloomed on Oct. 25, revealing the rarely seen moment when the plant’s male flowers release glistening strings of pollen. It’s not that the corpse flower is the only plant to attract pollinators like flies and beetles by putting out bad smells. Nor is it the only one that produces male and female flowers at the same time. “The fact that it does all of this at this outsized scale -- all of this together -- is what’s so unique about it biologically,” said Pati Vitt, senior scientist at the Chicago Botanic Garden. When a titan arum is ready to flower, a stalk starts to grow out of the soil. Once it has reached 4 to 10 feet, a red “skirt” unfurls. Though it has the appearance of a petal, it’s really a modified leaf called a spathe. Deep red and glistening, it looks like a raw steak. Hidden at the bottom of the spadix are rows of male flowers -- yellow sacs that look like corn kernels -- from where pollen will burst out. And right below them are rows of female flowers -- purple tubes called stamens topped by round orange balls, the stigmas that will be fertilized with pollen grains. In its native Sumatra, the corpse flower opens for only 24 hours. In captivity, it often lasts longer. With just a day to reproduce, the stakes are high. It would be easy if the plant could reproduce using its own pollen. But the plant needs fresh genetic material -- pollen from other corpse flowers -- to make the fruit and seeds that eventually will become healthy new plants. So it staggers things. The female flowers are ready first: They get sticky to trap the pollen grains. The male flowers won’t release their strings of pollen until hours later, when the plant’s female flowers are no longer able to be fertilized. This is how the plant avoids inbreeding. 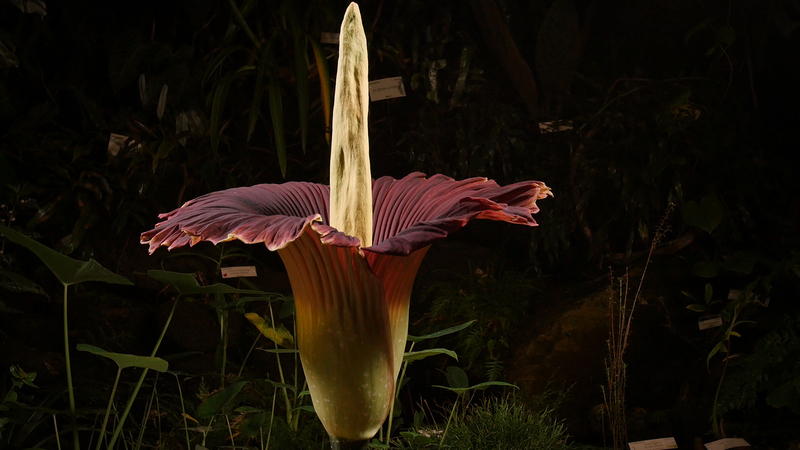 As its female flowers become receptive to pollen, the corpse flower sends out a powerful stench, more than 30 chemicals in all, according to a recent paper by Vijayasankar Raman, from the University of Mississippi, and colleagues. Different parts of the plant produce different chemicals at different stages of the flowering, said Raman. And the chemical compounds are released in pulses rather than in a continuous stream. This saves the plant energy, said Handley, of the UC Botanical Garden. Heat from the spadix, which warms up to body temperature, helps carry the compounds away. These putrid smells and the raw meat look attract the plant’s pollinators, insects that usually lay their eggs on animal carcasses. Carrion flies and beetles come and investigate, thinking the plant might be a good spot for their young. “They fumble around and leave, and in the best-case scenario they’re covered in pollen that they carry to another receptive plant,” said Handley. When a corpse flower is in bloom in a botanical garden, there usually aren’t any others that are open. 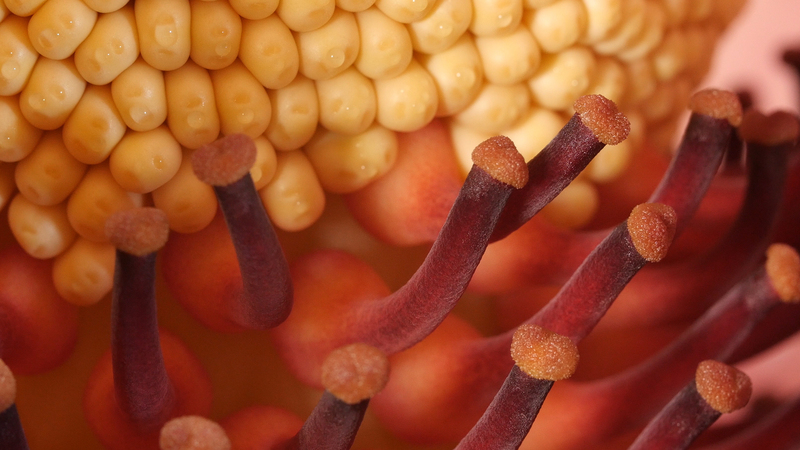 So biologists cut a hole on the side of the blooming plant through which they access the male flowers. With a metal spatula, they collect pollen by hand to freeze and use later to pollinate another corpse flower. Biologists are careful not to pollinate their corpse flowers too often, though, because growing fruit and seeds requires an enormous effort on the part of the plant. Corpse flowers are vulnerable: Poachers and deforestation have reduced their numbers in Sumatra. And although botanical gardens will occasionally sell them to the public, they warn that the plants need a tropical greenhouse with ample space. A corpse flower grows a 10-to-15-foot leaf every year, so tall and voluminous that it resembles a whole palm tree. “They’re not a realistic plant to grow at home,” said Handley, who pointed out that a number of titan arums have been returned to the UC Botanical Garden. 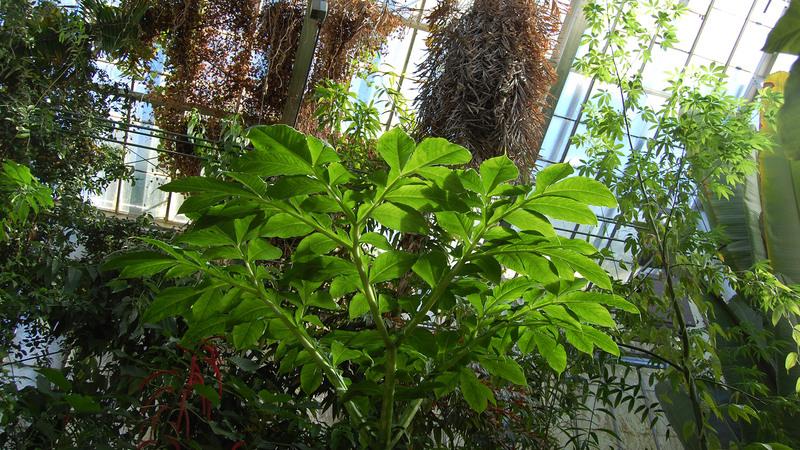 So for now it’s the waiting game, to see one of these lonely giant plants in the world’s museums and conservatories drawing thousands of visitors, rather than bugs.